Are you tired of poor drainage conditions around your home? Do you have old black corrugated pipes that are less than perfect? We build custom PVC drainage systems to address your unique drainage challenges. Designed and installed by drainage professionals after a thorough analysis of your property, our systems are high quality, low maintenance, and built to last a lifetime. Our drainage professionals meet with you to evaluate drainage conditions at your property. We work with you to determine how the problem conditions developed. After that, we start designing a custom solution for your home. We design and propose a detailed solution for your property. Usually, our proposals include a custom PVC drainage system with connections for downspouts, in-ground drain boxes, channel drains, French drains, or other drainage features. We may also propose additional drainage repairs for your property. Our crews install drainage systems with minimal impact to your property. Whether large or small, we provide a completely turnkey installation. Our goal is to make your property look as good as it did before we began the work – sometimes even better. We design our drainage systems to work 100% of the time. Downspout connections, in-ground drains/catch basins (custom or prefabricated), channel drains, French drains, or even outdoor showers may be part of your custom system. The best part? You can rest easy knowing that this system includes the materials and design qualities that will finally solve your drainage problem. When it's time for reliable, long-lasting drainage equipment, a custom PVC drainage system is the answer. Using the most durable materials available and applying the most effective piping practices, we build systems that are highly effective and practically maintenance-free. Compared to corrugated plastic drain lines, PVC moves up to three times as much water. And while thin corrugated material may only last a few years, PVC can deliver reliable performance for up to 100 years. If you’re weighing your options for a new or replacement drainage system, know this: Our custom thick-wall PVC systems outperform corrugated piping under all conditions. 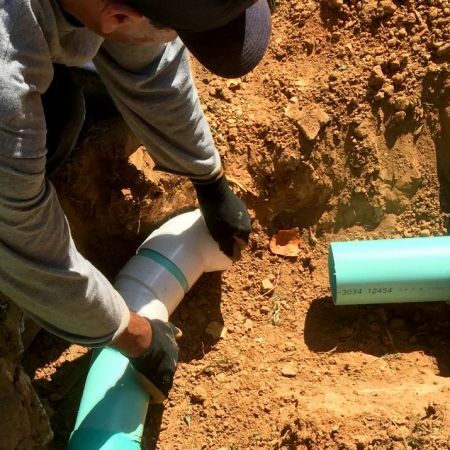 PVC drain lines are the best, and they’re all we ever use. Unlike standard corrugated plastic, PVC withstands abuse and lasts a lifetime. The help move downspout water to a suitable location, our PVC drainage systems often include downspout drain lines. Some replacement drainage systems benefit from catch basins and channel drains – especially when water collects in driveways, walkways, or turf areas. In some situations, installing a French drain is a good way to remove ground saturation and keep stormwater from accumulating in problem areas. Is your drainage correction in a technically challenging area? We love technical challenges, and our installations often require one or more of these techniques. Our team has the tools and the knowledge to go where other contractors can’t – or won’t.